132 min. Touchstone Pictures. Director: Derek Cianfrance. 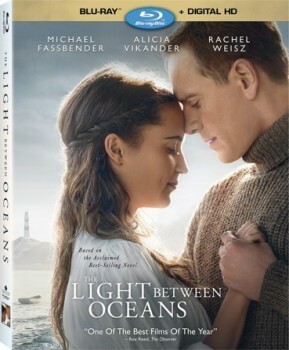 Cast: Michael Fassbender, Alicia Vikander, Rachel Weisz. Squint at the period drama The Light Between Oceans, and it’s not hard to see it as a prestige picture from the mid-twentieth century. With starker, chiaroscuro cinematography, it could have been a 1940s picture, and the film’s director has suggested a comparison to lush 1960s widescreen epics. Specifically, Derek Cianfrance describes his new film as “a John Cassavetes movie in a David Lean landscape,” and it’s the Cassavetes-esque deep dive into tortured souls that gives The Light Between Oceans its modern cinematic sensibility. Three months on the rock between oceans—a rock facing both directions like its namesake—pass without incident, but when the job becomes a permanent one, Tom finds himself prone to the possibilities of companionship with the local woman who first caught his eye upon his return from combat. In a postwar world bereft of men, an eager Isabel (Alicia Vikander) boldly suggests marriage, and an epistolary romance soon seals the deal. Both know pain and loss from the war, and life on the rock (prone to symbolic batterings of wind and rain) will surely bring them more, beyond their first wave of marital bliss. Stedman’s novel drew comparison to Thomas Hardy, and indeed once devastating incidents knock Tom and Isabel off balance, they’re prone to a big mistake with consequences for a local widow (Rachel Weisz). The story makes one big ask in terms of plausibility and coincidence, and by eliding several practical questions, Cianfrance makes Tom and Isabel seem pretty clueless at times. Mostly, though, we are invited into their emotional need and their mental struggles with conflicting moral responsibilities. Cianfrance makes intimate, psychologically penetrating films, with quiet spaces and moments of brutal intensity, and like his previous film The Place Beyond the Pines, The Light Between Oceans moves us by uncovering unexpected points of view (when the film tells its second love story, audience identification gets properly chastened) and investing in long-term developments, ripples that pass into the next generation. As unlikely as the story is, Cianfrance deftly steers the material through elemental themes of personal challenges and human relations: isolation and unconditional love, betrayal and forgiveness. As such, it’s a potboiler that’s also somewhat profound. Lenser Adam Arkapaw (Macbeth) helps Cianfrance fully to exploit the story’s visual possibilities, from the bracing location photography to the director’s masterful use of the closeup, and Alexandre Desplat lays on a typically swoony score, but above all, it’s the “faraway, so close” looks in the actors’ eyes that transport us. Touchstone Home Entertainment does a swell job of bringing The Light Between Oceans home in a Blu-ray + Digital HD special edition. The handsome digital-to-digital transfer preserves the filmmakers' intent with faithful color and contrast. The latter presents certain challenges, given that the film was shot almost entirely in natural light, leading to black levels and shadow detail that can struggle for clarity and chip away at the usual hi-def sense of depth. Still, that's part and parcel of the film's distinctive look, and a bit of noise is a fair tradeoff. Details and textures tend to be excellent, especially in beautiful daytime exteriors. The disc's lossless DTS-HD Master Audio 7.1 mix proves top of the line: crisp, clear, prioiritized dialogue rules the day, but the mix also provides a full-bodied treatment of the lush score and effects that emphasize the fearsome power of nature, a major plot element, with punchy LFE and thoughtful placement in the sound stage. The disc emphasizes quality over quantity with three outstanding bonus features. The first, an audio commentary with director Derek Cianfrance and Film Studies professor Phil Solomon, pairs the film's auteur with his former professor for a fascinating and friendly discussion of the filmmaking process, Cianfrance's intent, and Solomon's read on the results. "Bringing The Light to Life" (16:47, HD) maximizes its running time with a fascinating look at the rare approach taken to the making of this film. Writer/director Derek Cianfrance, Michael Fassbender, Alicia Vikander, Rachel Weisz, producer Jeffrey Clifford, producer David Heyman, and executive producer Rosie Alison discuss the effect of relocating to remote locations, immersion in the place and time, and working relationships (such as that between Cianfrance and Weisz), as well as some thematic and character analysis. "Lighthouse Keeper" (5:40, HD) hones in on the key production element of the lighthouse and the history that informed its depiction in the film's production design, choice of location, and ultimate execution. Cianfrance, supervising location manager Jared Connon, Clifford, Vikander, lighthouse keeper Ron Sword, Heyman, and Fassbender comment. All site content © 2000-2019 Peter Canavese. Page generated at 04/18/2019 02:01:34AM.